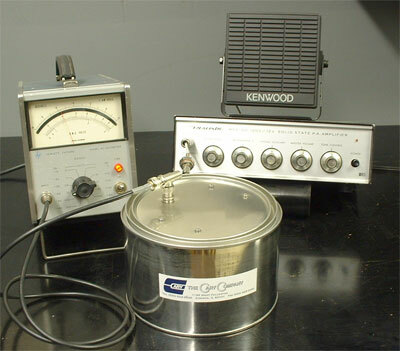 The Geller Labs JCan instrument in use in my shop. and features an ultra-low capacitance and noise amplifier. I remember reading Scientific American's popular section named The Amateur Scientist. Unusual scientific projects were described with enough detail to allow home construction at a relatively low cost. These projects were not toys but rather inspiring examples of fundamental science based upon sound engineering principles. Geller Labs has started to introduce a new set of relatively high end engineering and physics experiments. Each project includes a kit of parts. This approach greatly increases the chance of successful project completion. Directly measuring resistor noise is not as simple as connecting a low-range voltmeter and reading the result. Joe Geller, KO2Y has determined that several problems exist that prevents low-cost methods from working. He has successfully overcome these problems and has implemented an interesting solution using modern components. He has named this device the Geller JCan. On his website Joe says "Whether you are an audiophile, an instrument designer, an EE or physics student or an electronics enthusiast, you might find these problems in measuring resistor noise interesting. You might even want to build a JCan and try it out yourself! 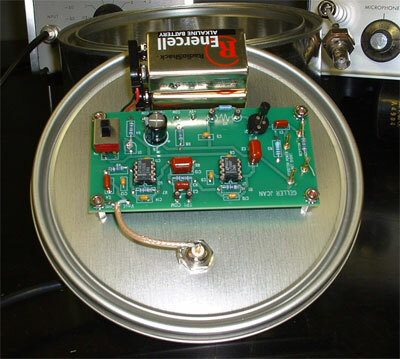 The JCan is a very sensitive instrument that can directly measure resistor noise when used with a standard AC voltmeter capable of measuring AC voltages in a range of 1 mV to 20 mV AC at audio frequencies. The JCan can also measure thermal noise plus shot noise by injecting a small current into resistors under test." under the lid of the shielding enclosure. The J-Can is a battery-powered special amplifier that is completely shielded from outside interference. Even the target resistor is enclosed inside the JCan during testing. A shielded signal connector is the only thing visible on the shield can. The older HP 400 series AC voltmeters are very useful and widely available as surplus instruments. An HP400 AC voltmeter is also a good companion instrument for working with the JCan. I decided to use an additional audio amplifier to allow hearing the output from the instrument. This definitely added an interesting dimension to the project and allows comparing the near white noise with no power to the occasional clicks of shot noise under power. I found that building and using the JCan is fun. I also learned more about the underlying fundamentals and problems of resistor noise measurement. A mentor said to me a long time ago "remember the first three letters of the word 'fundamental' spells FUN!"